Just wondering what everyone else's thoughts are on the latest Onell design blog entry. Is Argen dead or has he just been defeated??? Does this mean we wont be seeing him in anymore drops?? grune wrote: Just wondering what everyone else's thoughts are on the latest Onell design blog entry. Is Argen dead or has he just been defeated??? Does this mean we wont be seeing him in anymore drops?? If he is dead, we probably won't be seeing the named character Argen in drops. But we will likely still be seeing the buildman. Argen is just a buildman with special tampographs and an axis joint set. Argen is Far More than just another buildman w/ tampo's. He was the main reason I started collecting Glyos on after reading his story in the archives and the continued stories with him in it. Lazzy Lizard wrote: Argen is Far More than just another buildman w/ tampo's. They said that we might not be getting him anympre, which I assume they meant toys of him. As a toy, he is not much more than a normal buildman. If Argen bit it, it might be the end of that character, but not the end of the Buildman. Storyline-wise, I think that Enyriun would be a worthy successor to take over the Gendrone Rebellion. Maybe that battle is chronologically BEFORE the appearance of Electro Revenant Argen and even Dreadvalken Phantom Argen? Maybe Argen will keep on in a non-corporeal form while Enyrium takes over the Gendrone? Undrave wrote: Maybe that battle is chronologically BEFORE the appearance of Electro Revenant Argen and even Dreadvalken Phantom Argen? The seeds of the future lie buried in the past! Ok, I like the idea of an Argen ghost. I think it would be cool if he then possessed a new kind of buildman that was a brand-new model with completely different kinds of weapons and armor. Perhaps Argen made a backup of himself beforehand. I mean, after he got blown away by the Syclodoc, you'd think he would, right? I doubt it's the last of Argen, but for now it's time he got a break. The build has been in most drops in the last couple years, we've seen a lot of the other molds freshened up with new paint masks (Super Cray, Sarvos, Noboto) or new components (Armorvor, Pheyden twice) in that time. I expect we'll get releases as Axis Armored Buildmen so you can still have the Argen parts if you want them until it's time for him to make a comeback. TJOmega wrote: I doubt it's the last of Argen, but for now it's time he got a break. The build has been in most drops in the last couple years, we've seen a lot of the other molds freshened up with new paint masks (Super Cray, Sarvos, Noboto) or new components (Armorvor, Pheyden twice) in that time. I expect we'll get releases as Axis Armored Buildmen so you can still have the Argen parts if you want them until it's time for him to make a comeback. I think it's more likely that the standard "Argen" axis build will no longer be sold (at least for a while) and will instead be sold in different configurations or once again as separate figures. We don't quite know the abilities of the Villser, hell, they needed to destroy any chance of life on a planet. What we do know is that it was the greatest threat to all of Glyos and that the Buildman project was to emulate Villser. What do we know of Argen? He killed Govurom, was awakened by Pheyden/Hades, sought out to free the Buildmen and give them free thought, was told never to trust the Glyans by the Renagades, was chased down by Callgrim, fought with Glyan Kane, grew an army, went to the Council of Traveler and teamed up with Phanost, and drifted with Phanost for a bit where Argen learned to mimic life forms. After that he mutated into Argen X and fought with Hades. Besides, the way I remember it, Govy killed Argen and then walked off into the sunset. Looks like another split in time and alternate yet canon universe. I hope someone remembered to bring ice to this party. I feel the same as Lazzy. 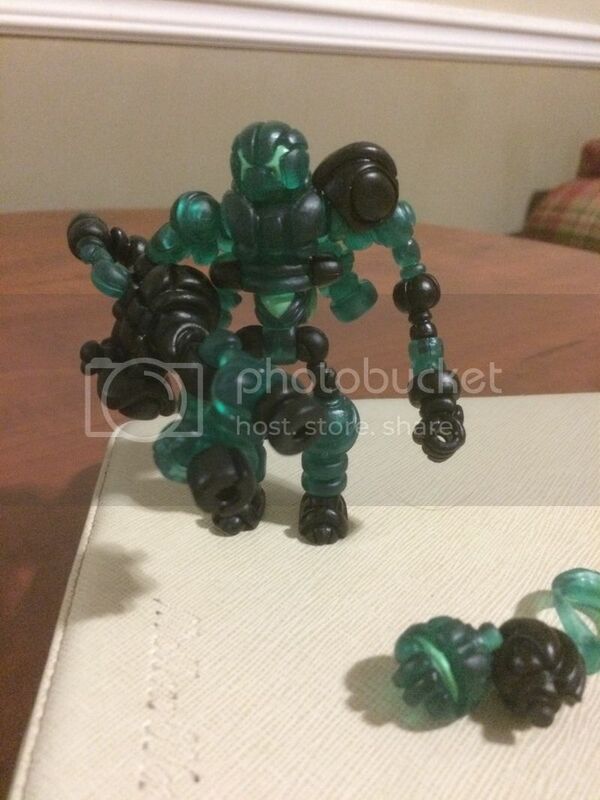 Argen was the character that got me into glyos, the first posts I ever saw on the blog were him on his explorations in the beginning of 2014 and he was the first onell figure I ever got. I hope he was just defeated and not dead. If he is dead may he be remembered for who he once was not for who he became. I have to say he's dead. With how dangerous he has gotten, I don't think Hades would take any chance in leaving him alive. I could see his programming being backed up somewhere and uploading into a new body, causing him to come back as some sort of rogue revnant. Argen carries the Villser virus, so I'm assuming he's far from done. Besides, letting Hades think he's dead (or severely damaged), gives Argen the ability to move freely with no one looking for him. Considering the lingering Villser influence he may take on a completely new form. A mutation, so to speak. We've already seen that with the introduction of the new head. I say this as pure speculation with no inside knowledge whatsoever but what if there's a transition to that new form. Argen has taken various enhanced forms throughout the years and peaked in overall parts with the Rigkiller. I'd say its completely possible to see a mutated Argen with four or six axis joints or four axis joints and two swings. Many many options to take him using existing parts before an all-new form is introduced if that's the direction. Some of the old Passcode games feature buildmen combinations in all sorts of forms. Well, there is precedent for a "multiverse"-style element in the canon, so think of them less as "plot holes" and more as branches of alternate realities. It's unfortunate that there has never been much expansion on that. I'd completely agree with the alternate reality thing if it was clearer and just made more sense.